A WORD OF CAUTION…. Long-term care planning requires in depth knowledge of tax law, proficiency in estate planning, and a thorough understanding of the Medicaid laws and regulations which are constantly updated and changing. Long-term care estate planning and Medicaid planning should only be done under the supervision of an Attorney with specific knowledge in the areas of Elder Law and Medicaid rules and regulations. Certain transfers and modifications of assets can have significant tax ramifications that should be discussed with your attorney. Furthermore, improper transfers or gifts can disqualify a Medicaid beneficiary, result in a significant period of ineligibility for Medicaid benefits, and even future Medicaid recovery efforts. 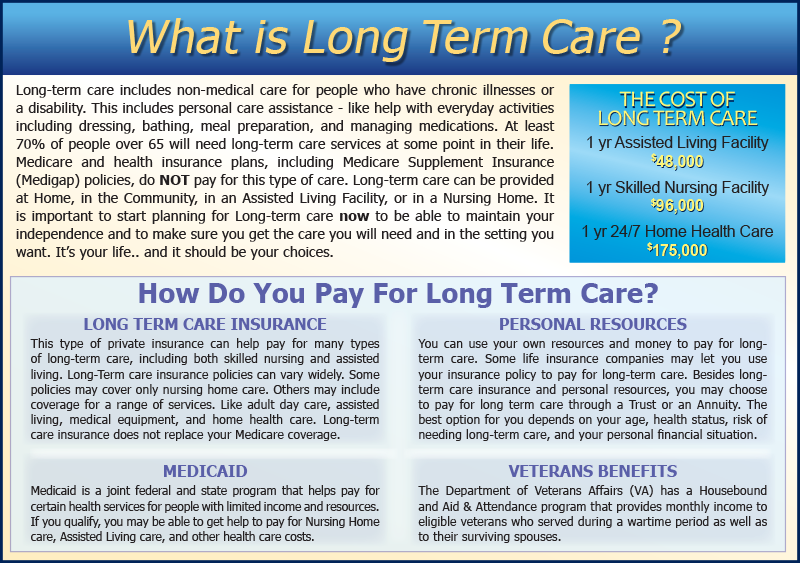 Many people think the phrase “long-term care” refers to an insurance policy. While insurance may be part of your strategy, long-term care encompasses everything from your future medical care and finances, to where you will live and how you will navigate the myriad of legal, family, and social dynamics along the way. Life Planning Law Firm, P.A. assists seniors and their families in maximizing their quality of life and independence now through our Life Care Planning services which bundles asset protection, public benefits qualification, care coordination, nursing home connection (matching clients to the senior communities or home health care service companies that befit their specific needs, wants and budget), and crisis intervention services — all in one convenient service package. Senior advocacy and communication with health care professionals, your family and others who are involved or directly assisting with your care and wellbeing. Obtaining good long term care and figuring out how it can be paid for is a daunting task for most seniors and their families. Our long term care services allow you and loved ones to rest easy knowing you will be able to obtain and comfortably transition to a life that includes care that’s right for you. Find out how much long term care costs in your state.